"Thirty-five years after Carol Kleyn first started hawking her records at fairs and on kaleidoscopic street corners, Drag City are now proud and privileged to give ‘Love Has Made Me Stronger’ a full release. The sound of ‘Love Has Made Me Stronger’ is a sound of joy. 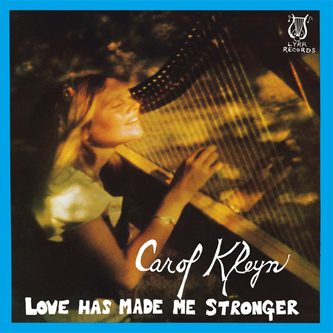 Carol Kleyn’s music is clearly meant to express love and happiness, desire and wonder, and Carol lets her voice communicate this as she’s done at countless shows with only a single accompanying instrument - harp in the early part of the record, keyboards on the second half. Ardent listeners may compare Carol Kleyn to West Coast singers of the era such as Joni Mitchell and Essra Mohawk, but it is Drag City’s belief that Carol was singing a sound not just her own, but a sound that expressed the time and place that changed so many lives back then. Carol’s ethereal voice dances over her harp and keyboard arrangements as she sings her dreamy odes to nature, love and living with a full and open heart."